You can install Anaconda using either the graphical installer (“wizard”) or the command line (“manual”) instructions below. If you are unsure, choose the graphical install. Download the graphical macOS installer for your version of Python. OPTIONAL: Verify data integrity with MD5 or SHA-256. For more information on hashes, see What about cryptographic hash verification?. Double-click the downloaded file and click continue to start the installation. Answer the prompts on the Introduction, Read Me, and License screens. OR, click the Change Install Location button to install in another location (not recommended). On the Destination Select screen, select Install for me only. 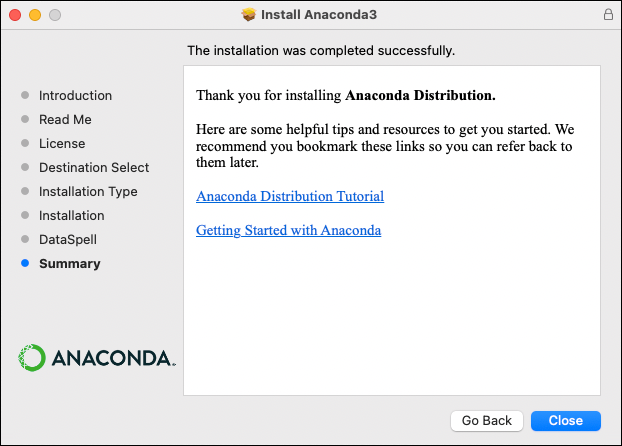 If you get the error message “You cannot install Anaconda in this location,” reselect Install for me only. Or to install Anaconda without PyCharm, click the Continue button. After your install is complete, verify it by opening Anaconda Navigator, a program that is included with Anaconda: from Launchpad, select Anaconda Navigator. If Navigator opens, you have successfully installed Anaconda. If not, check that you completed each step above, then see our Help page. For more information about using Anaconda-Navigator, see Navigator. Use this method if you prefer to use a terminal window. In your browser, download the command-line version of the macOS installer for your system. OPTIONAL: Verify data integrity with MD5 or SHA-256. For more information on hashes, see What about cryptographic hash verification? Include the bash command regardless of whether or not you are using the Bash shell. Replace ~/Downloads with your actual path and Anaconda3-2019.03-MacOSX-x86_64.sh with actual name of the file you downloaded. The installer prompts “In order to continue the installation process, please review the license agreement.” Click Enter to view license terms. Scroll to the bottom of the license terms and enter yes to agree to them. The installer prompts you to Press Enter to confirm the location, Press CTRL-C to cancel the installation or specify an alternate installation directory. 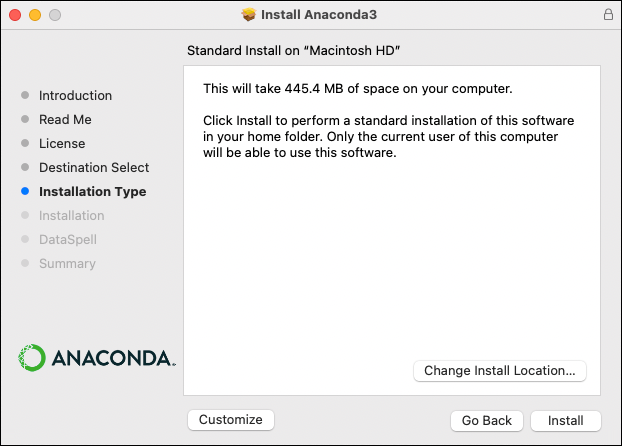 If you accept the default install location, the installer displays “PREFIX=/home/<user>/anaconda<2 or 3>” and continues the installation. It may take a few minutes to complete. We recommend you accept the default install location. The installer prompts “Do you wish the installer to initialize Anaconda3 by running conda init?” We recommend “yes”. If you enter “no”, then conda will not modify your shell scripts at all. In order to initialize after the installation process is done, first run source <path to conda>/bin/activate and then run conda init. 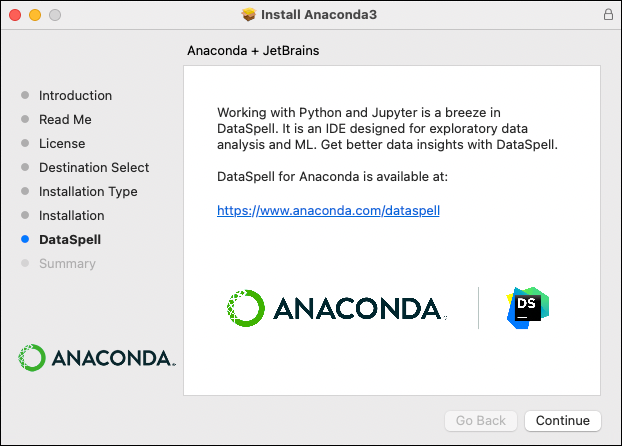 Optional: The installer describes the partnership between Anaconda and JetBrains and provides a link to install PyCharm for Anaconda at https://www.anaconda.com/pycharm. Close and open your terminal window for the Anaconda installation to take effect. To verify the installation, see Verifying your installation. To begin using Anaconda, see Getting started with Anaconda.